A choir conductor from North Wales looking forward to seeing one of his favourite bands was stunned to find himself joining them on stage to sing the national anthem in front of thousands of fans. 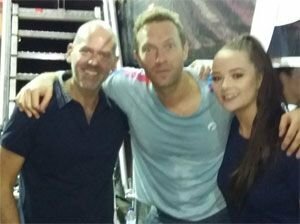 Ahead of Tuesday night’s concert, Mr Jones practiced at the stadium with 19-year-old Elin Hughes of Trinity University College in Carmarthen, and the two of them later joined Coldplay for the surprise rendition of the anthem. The following day, he was asked to do it again alongside actor Rob Brydon. “It was an amazing experience, really magical,” said Mr Jones, who was brought up in Llanymynech and lived in Broughton, but now lives in Birmingham.